Who and what is Patternlab.london? Learn about the company. No prior knowledge of pattern cutting or drafting basic blocks required. Simply design your basic blocks in the Lab and we’ll do all of the hard work! Follow our detailed step-by-step measurement video to help you take accurate measurements first time. Add your unique measurements to a profile to draft custom-fitting basic blocks that fit your shape accurately. Or use our industry-standard size charts to instantly draft basic blocks in a range of standard sizes: UK4 – UK24. Build your blocks step-by-step with our easy-to-use interface. Add design elements to draft hundreds of variations and watch your blocks come to life, using the preview pane. Have professional control over the fit of your blocks, by entering your own custom ease or let the lab take control with our automatic suggestions. Purchase your blocks as a multi-page PDF pattern available in a variety of paper sizes: A4, A3, A2, A1, A0. Purchase your blocks as ePatterns, and learn how to customise your block into hundreds of finished designs using our FREE pattern cutting courses and tutorials. Become a registered user and store hundreds of basic blocks in your own personal library. Download your blocks from anywhere in the world 24hrs a day. Make endless adjustments to your measurements before and after purchase. The lab will redraft your blocks for free – great when it comes to refining your blocks for the best possible fit. Adjust your measurements for one block, a whole order or every existing block you’ve ever created. The lab will automatically make those changes. Perfect for adapting your basic blocks to annual body fluctuations. Sew, sell, share, mass production – it makes no difference, all garments produced from PaternLab patterns are royalty free. Read our Terms and conditions to get the full picture. Join the community; ask a question, send us your love or show us your creations. It’s all in our Gallery! It’s simple… Get drafting now and start making your own accurately fitting clothes. PatternLab is the brainchild of Ralph and Mike who met back in 2014 over a shared idea. Despite living on opposite sides of the planet, Ralph in London and Mike in rural Australia, together over a number of years, and in their spare time, have built PatternLab from the ground up, developing it into a highly complex and versatile software system, making PatternLab a true testament to the power of collaboration over the internet. Since April 2018, both Mike and Ralph have quit their jobs to focus their full energy on PatternLab. They are constantly experimenting and brainstorming to refine the drafting process, bring their customers more dynamic products and update the Lab with exciting new features. Ralph is a fashion designer and pattern cutter from London. For the past four years, he has been researching, designing and developing an automatic drafting process that works for a large range of body types and sizes. 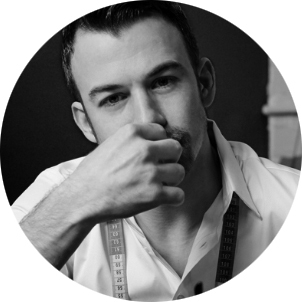 Ralph has over 10 year’s experience working in the fashion industry. He has designed and cut couture collections for London Fashion Week and set up his own sewing pattern line. Before this, he was a prolific blogger creating tutorials on corsetry construction, design concept, print design and illustration.